Our work party on the first Sunday of the month was very successful despite the heavy mist in the earlier part of the morning. By coffee break we were able to see parts of the meadow from the heath through the mist. There were some wonderful spiders webs seen on the gorse and other bushes. I also saw some very good examples of the red (with white spots) Fly Agaric mushrooms at the edge of the heath, these were about the size of tea plates. Two of our volunteers managed to rake up most of the remaining mown grass from the meadow. The grass piles are quite large at the moment but these will start to rot down, heating up to provide central heating for anything which hibernates there (like grass snakes or mice or insects). We were able to use the petrol brushcutter to clear most of the remaining bracken and small birch scrub from the top of the Heath area. This was burnt straight away along with the pile of old holly cuttings so as to leave the Heath clear of debris. One of our young volunteers ably assisted in lighting the bonfire and feeding it (we always have suitable jobs for anyone interested in a bit of outdoor activity). We also had a small work party on Wednesday (11th November) in Villa Wood. Andy used the brushcutter to clear more of the path beside the brook towards the Sunnymead lane end, this will help it to dry out a bit by letting the light down to the ground. The other three of us tackled the clearing up of the damaged trees from the damaged ‘bluebell’ area. The damaged tree stumps have been cut to a proper ‘coppiced’ level from which they will grow next year. We untangled, sawed to a moveable size and then lifted the branches hacked by the ‘diggers’ onto two nearby log piles. We noticed as we were doing this that already some ladybirds were getting ready to hibernate in the existing log pile which we made a few weeks ago. This should be the last clear up of the area now, we will have to wait until the spring to see how many of the wild flowers regrow. Even today we found some bluebell bulbs still on the surface which we pushed back into the soil to grow. A nice surprise today was that we found a large frog in this same area, this is the first frog that I have seen on site in the five years or so that I have been involved with Cockaynes Reserve. We are always pleased when we are able to confirm that creatures or plants are actually present but may not have been spotted previously or have been absent for some reason. I’ve added some photos of the ‘cleaned’ area and the frog for interest. We are still uploading photos to our web site (http://cockaynes.org.uk/)if anyone has any that are suitable and are willing to let us display them. Fly Agaric mushrooms on heath. Young volunteer doing a sterling job clearing scrub on heath, 1/11/15. Work party tea break! 1/11/15. Spiders webs in the mist, 1/11/15. Spiders webs in the mist on the meadow, 1/11/15. Villa Wood bluebell digging damaged area after clear up, 11/11/15. ‘Went to mow a meadow’. Sunshine & hard work. With the help of Alan from Essex Wildlife Trust driving (being pulled along) the mower, we have managed to mow all the intended area. I did take a turn on the mower…it is a beast to handle! We have left uncut some areas as wildlife refuges / hibernation places. Valerie & I have raked some of the grass into heaps which in turn are being made into larger heaps at the edge of the meadow. These larger heaps will form hibernaculums (places to overwinter) for the grass snakes & other small creatures. I did actually see a fieldmouse heading for one of the refuge places while I was cutting nearby. A late morning walk around site this morning. The reserve is very wet after the rain with lots of puddles but most of the paths are still dry. We saw Red Darter dragonflies laying eggs in the puddles, unfortunately these eggs will not survive as they need to be laid in the main ponds. Rabbits were seen running from the Scrape into Villa Wood with Coots, Moorhen, Dabchick, pair of Mallards, female Tufted Duck, and large blue dragonflies, all on view on the water. There was a Speckled Wood butterfly on the path beside the silt ponds. 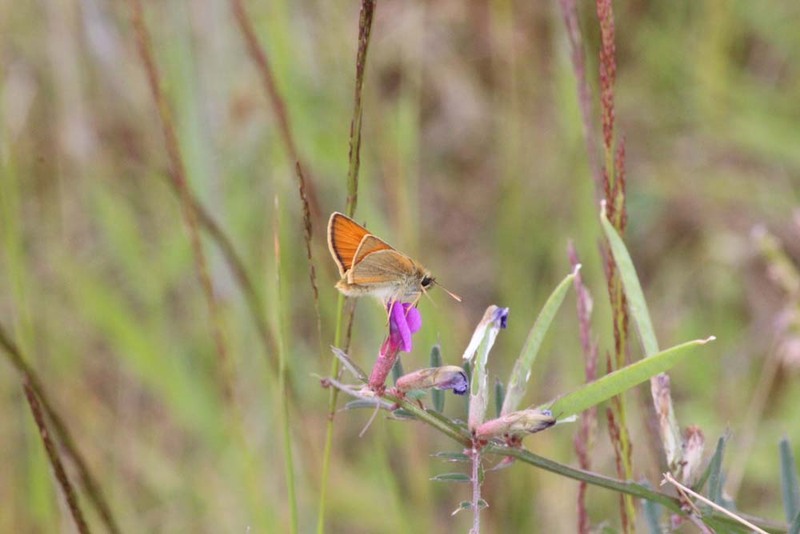 In the meadow area we saw a Small Copper butterfly, an Angle Shades moth and a Small Heath butterfly all basking in the sun. We were also lucky to find a large hairy caterpillar (probably about 75mm long) among the Sweet Rushes, this is the Fox moth caterpillar (see the picture on the ‘moths photo page’). There were also lots of Crane Flies (daddy long legs) among the grasses with the grasshoppers and crickets. We saw a freshly emerged Comma butterfly and a Treble-bar moth basking on the bramble by the railway path with lots of grasshoppers among the short grass. The Green Woodpecker made its presence known by it’s ‘laughing’ call in Cockaynes Wood and a Kestrel was hovering over the edge of the fishing lake. There are still a number of flowers on show. In the meadow we found pink flowers of Centaury, purple Self Heal, yellow of Greater Trefoil, Hawkbit, Ragwort and Agrimony, white flowers of Clover. The St Johns Wort and Fleabane were in flower nearby. Reindeer Moss is starting to show its silvery fronds in some of the wetter parts of the meadow. Elsewhere on site there are some good displays of rose hips from the Dog Rose and some of the holly in Cockaynes Wood has produced red berries this year. A pink Campion was still in flower in Villa Wood. There are now lots of different fungi to be seen all over the reserve. (New uploads to photo page). Moth night (28/8/2015) results summary. (54 moth species & numerous Hornets). 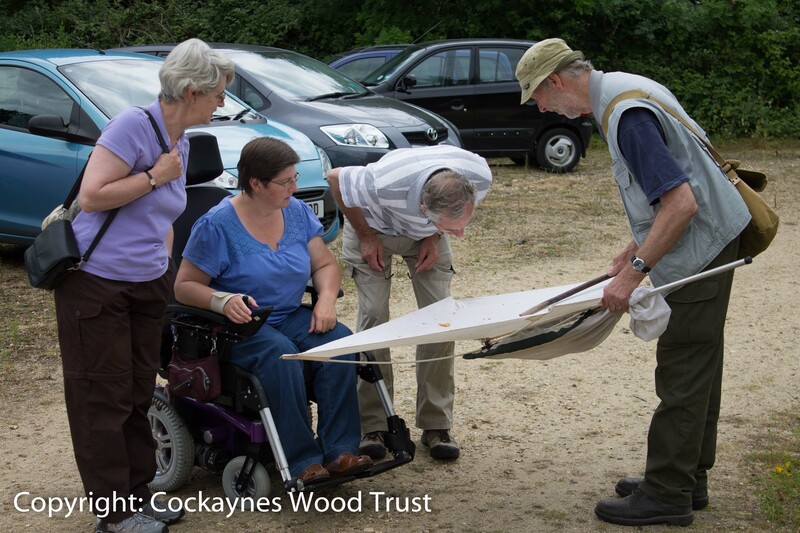 We had a lovely sunny start to our open day over at the Cockaynes Wood reserve last weekend. The rain did arrive later on in the morning but not before plenty of visitors arrived to see the site and try the activities available. Refreshments were set up in the old Nissan hut with the assistance of the Tendring group of Essex Wildlife Trust. The Cockaynes Wood Trust marquee provided information about the site and general wildlife information and various activities for children including directions for the family nature trail and colouring pages. In the main yard area, there was a craft activity provided by Essex Wildlife Trust and also demonstrating the pole lathe and green woodworking techniques we had both the Colchester Countryside Volunteer Rangers and Mark, one of our regular work party volunteers. 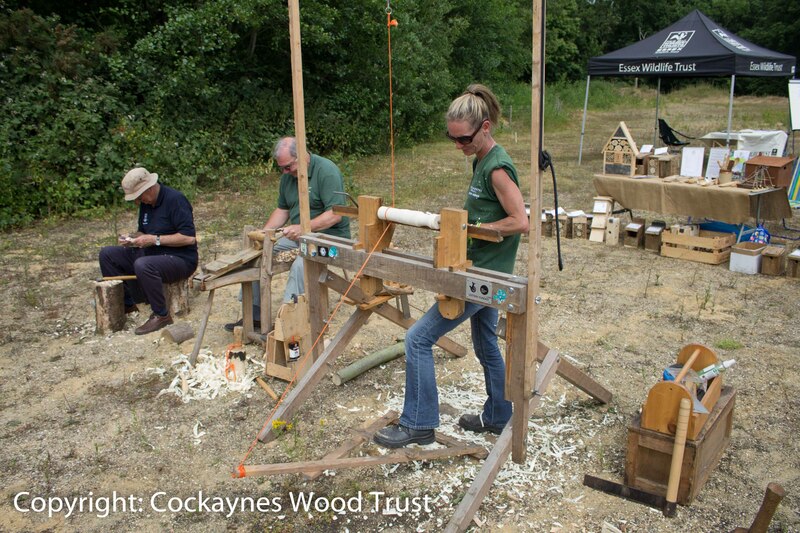 The CCRV are based at Highwoods Country Park in Colchester and use locally sourced materials to make a variety of wooden tools, utensils and bird and insect boxes among other items. Guided walks around the site were led by Cockaynes Wood Trust with the assistance of members from the Colchester Natural History Group who were on hand to lend assistance with identifying many of the plants and insects seen on the day. Some of the highlights seen included the very well camoflaged Brimstone butterfly caterpillars on the Alder Buckthorn trees, Oyster Catchers on the scrape and Reed Warblers flying around the ponds. 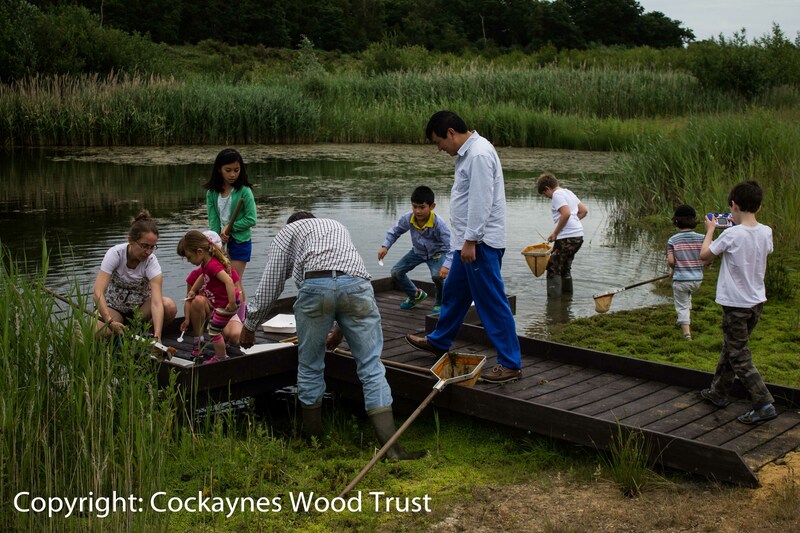 Our new pond dipping platform on the small pond proved to be a huge success with children and adults alike. The pond proved to be teaming with wildlife and it was great to be able to help everyone identify the creatures they found. 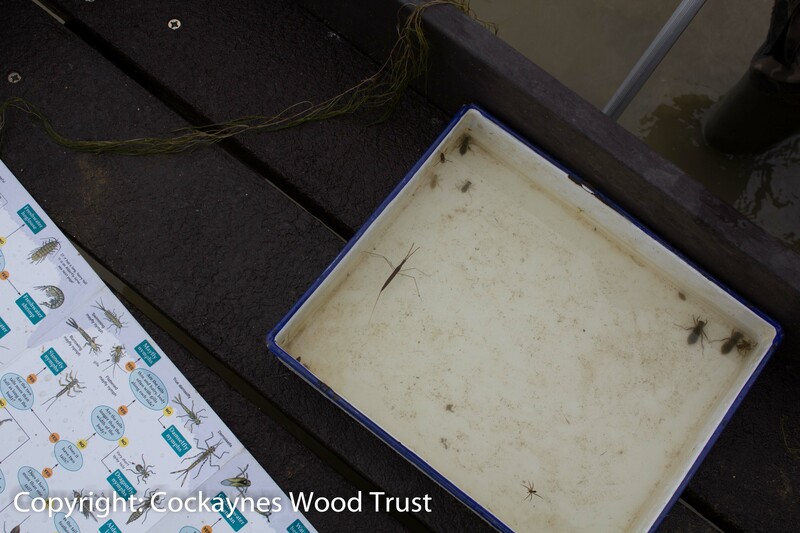 These included many juvenile newts (efts), several different species of Dragonfly and Damselfly larvae, snails, freshwater leech, shrimps and a water stick insect. All in all, a lovely day was had by all despite the rain which did keep visitors away in the afternoon. We are looking forward to building on the successes of this event for next year as the site continues to grow and improve. Lots more pictures of the day can be seen on the Event Photos page here. A walk on site today to put up posters for the Open Day (28th June) & meet people enjoying the Reserve. Unfortunately one of the posters was torn in half by the time we got back to our car, but it was mended for others to read. At the Scrape we spotted two of the Lapwing chicks (one flew across the water as we walked past) with one of the adults, the other adult was on the far side of the Scrape & too far to see any other chicks. There was also a Moorhen with five chicks on the water & a Coot family also. On the Small Pond we saw a Coot with four chicks. Walking through the Meadow area we found more of the Yellow Rattle flowers, a Meadow Brown Butterfly & a Small Skipper butterfly. 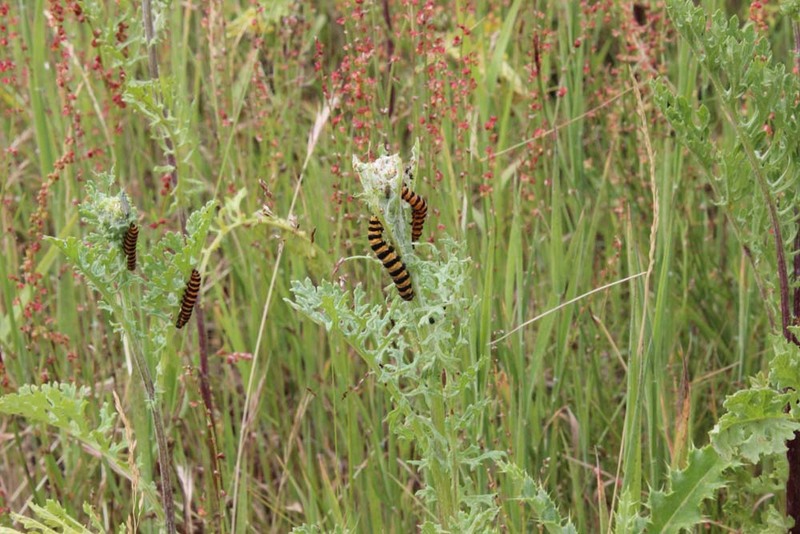 In the Yard area we found Cinnabar Moth Caterpillars on the Ragwort plants with plenty of the moths flying. 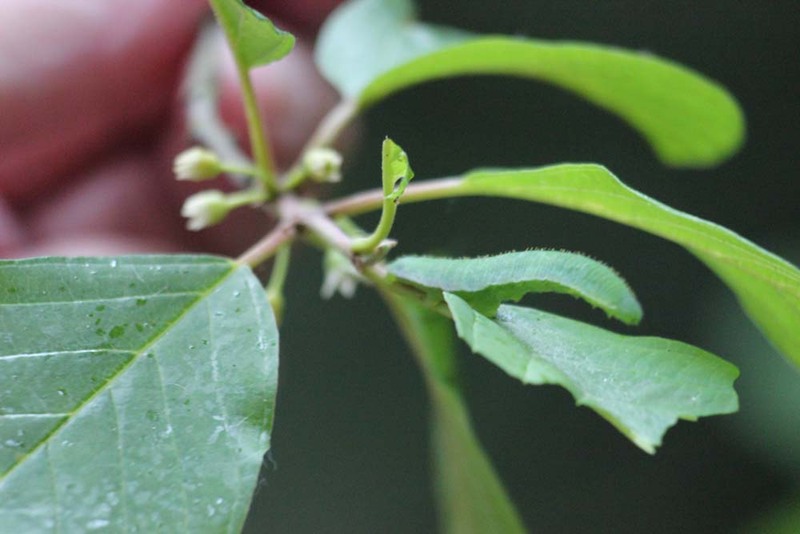 We also found some Brimstone Moth Caterpillars on the Alder Buckthorn trees in Cockaynes Wood. 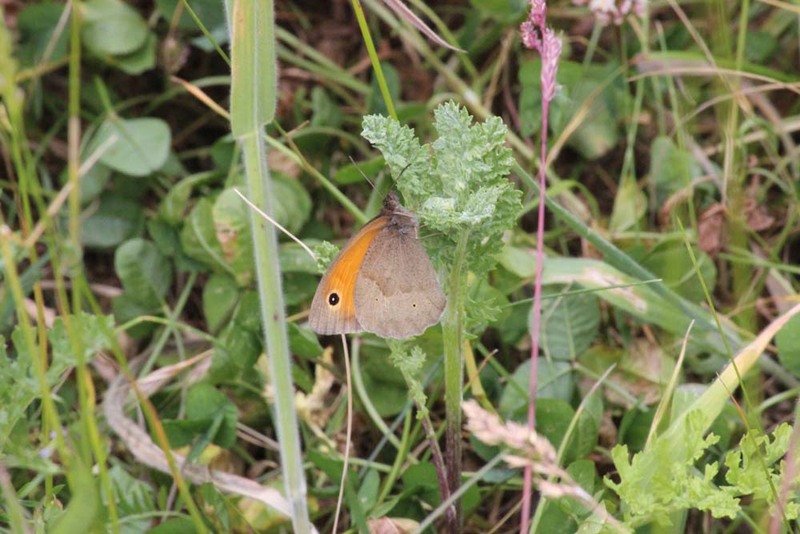 A short walk on site this morning found several Common Blue and some Small Heath butterflies on the meadow area. Also there are a small number of Yellow Rattle flowers, a Dog Rose in flower and the orange Fox And Cubs at the top of the meadow near the old tree stumps. The Gorse on the Heath is showing bright yellow flowers and if you look a bit closer to the ground, some of the older heather is just starting to show signs of flowers. Not so encouraging is the spread of bracken on the Heath which will need some method of control soon by our Work Party Team. Better news is that the Common Cow Wheat (one of the rare species which is found on our site) is spreading / flowering along the path in Cockaynes Wood & along the heath into the bracken. Birds seen today included the Kestrel hovering by the Large Silt Pond & a Hobby Hawk over the Scrape. The Hobby was diving & swooping over the water chasing dragonflies, but was too quick & not close enough for any photo shot. It did, however, get too close to the Lapwing chicks & was chased by the adult lapwing. On the small sand cliff by the metal gates I found a Tawny Mining Bee near it’s nest hole & lots of Digger Wasps visiting their nest pipes nearby (the nest pipes are sometimes sticking out of the sand by up to 20mm of more & 8mm diameter, we will upload some pictures onto the website soon).